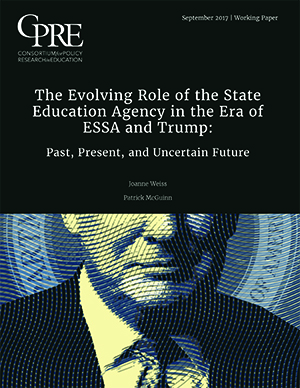 As we approach a federal deadline for state ESSA plans, a working paper by authors Joanne Weiss and CPRE Senior Research Specialist Patrick McGuinn (Drew University), outlines the opportunities and challenges State Education Agencies face with increased power and increased responsibility. Under the Every Student Succeeds Act (ESSA) of 2015, states have considerably more flexibility and authority in K-12 education than they had under the previous federal education law, No Child Left Behind (NCLB). The Trump administration and the Republican Congress, meanwhile, moved in 2017 to further loosen federal accountability rules and give states even more control over their school systems. With this increased power for states comes the increased responsibility to support the improvement of educational outcomes for every student. Leaders at the helm of state education agencies (SEAs) find themselves in a moment of both great change and great opportunity, as many agencies move away from a predominant focus on compliance with federal regulations and programmatically dictated uses of funds, and toward a broader focus on supporting districts and schools. For many advocates of low-performing students, it is also a moment of potential peril if states fail to embrace their new responsibilities or weaken their commitment to improve educational opportunity and outcomes. Click here, to download the full report. States must submit their ESSA plans to the U.S. Department of Education (USED) by September 2017 and the law itself goes into effect during the 2017-2018 school year. As the definition of and responsibility for school district success changes in this new environment, the roles of the SEA deserve reconsideration. There is no "correct" set of roles for SEAs, no consistent answer to the question of which activities a state agency should or should not engage in. Each SEA is starting from a different place along a change management continuum, and each has different educational strengths and assets to build upon, different needs to address, and a unique set of laws and governance structures. However, if the country is to close its longstanding racial and socioeconomic achievement gaps and address concerns about the nation's overall educational performance, states and SEAs will increasingly need to lead the effort.